The View Resort is a Project of Sharm Up for Touristic Development and it was designed to offer a relaxing and comfortable luxury resort for people all over the world to enjoy their life in our resort with wonderful scenery of the beautiful Red Sea, Tiran Island and the amazing mountains of Sinai. The View is located in the center of Nabq Bay, which is already well known by the tourism industry and where 27 major high class luxury resorts in the region can be found. With a great combination of natural surroundings, gardens, waterfalls and pools, View is the perfect place to enjoy Sharm and to relax during your holidays. 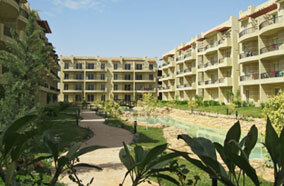 The quiet peaceful location makes the resort also a serene escape from the busy city life. As View was developed to offer a great blend of atmosphere, the spacious ambiance and natural lighting of every apartment overlooking beautifully landscaped gardens, lakes and pools make the resort really quiet and relaxing. The View offers a vibrant, serene and natural setting that also creates a peaceful, authentic environment and refreshing ambiance. The Resort’s state of art design near beautiful surroundings with amazing views of the Red Sea, Tiran Island and Sinai Mountains are sure to make you enjoy the best time ever.